Dance India Dance (DID) season-5 winner Proneeta Swargiary and her team is going to present the biggest dance camp ever in Assam. The 10-day dance camp begins from January 8 and will end on January 18, 2018. The camp led by Dance India Dance (DID) season-5 winner Proneeta Swargiary will be held in three venues. On January 8, 9 and 10, the dance camp will be held at New Horizon Kids School near UN Academy school in Kokrajhar district. The dance camp will also be held at Bir Dwimalu Road Community Hall at Bathoupuri, near Balaji Mandir (ISBT), Guwahati on January 16, 17 and 18. It will also be held at Ringu Damsa Hall, near Diamond English School, Nalbari ward – 2 in Udalguri district. 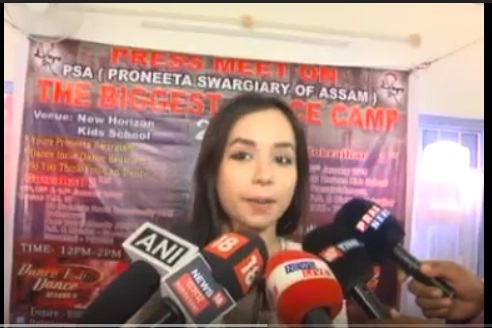 Talking to reporters, Proneeta Swargiary said the 10-day dance workshop from January 8 to 18 at three locations of Kokrajhar, Guwahati and Udalguri in Assam will be organized in a big way. She further added the collection money from the dance workshop will be donated to NGO orphanage, Bodoland Children House. “Many orphaned children are living in this orphanage, who are mostly victims of insurgency, accidents or belonging to very poor family. The NGO is taking care of their education. The NGO requested me to extend help and so I have organized this dance workshop and all the money will be given to them,” said Proneeta. She also appealed to all the people to cooperate and bring their children to the dance workshop to help the orphaned children living in the orphanage.